Brussels sprout (plural Brussels sprouts), also known as brussels sprout (without the capital B) and brussel sprout, is the common name for a cultivar group, Brassica oleracea Gemmifera Group, of the wild cabbage (B. oleracea) of the mustard family Brassicaceae (or Cruciferae). Also known as Brassica oleracea var gemmifera, this plant is a cool season biennial, with simple, alternate leaves, flowers borne in terminal racemes, and axillary buds that develop along the stem into small, cabbage-like heads (Mills 2001). The term Brussels sprouts also is used for these edible, leafy, green buds, which are popular food items. 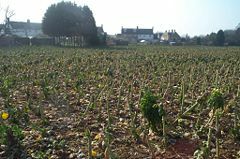 Breeding work, primarily spearheaded in Europe, has resulted in diverse cultivars of Brussels sprouts, selected for such qualities as uniformity of sprout growth, vigor, sprout size, and disease resistance (Mills 2001). In addition to offering a unique flavor, Brussels sprouts offer a good source of nutrition. Forerunners to modern Brussels sprouts were likely cultivated in Ancient Rome and possibly as early as the 1200s, in Belgium (Pfyffer 2004). 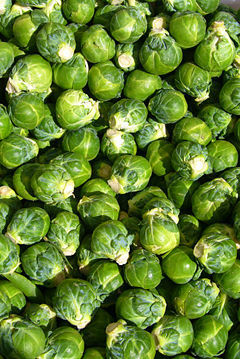 The first written description of Brussels sprouts was in 1587 (Folsom 2005). Brussels sprouts were popularly cultivated as a vegetable crop in sixteenth century Belgium and spread from there to other countries in temperate Europe (Mills 2001). Brassica oleracea var. gemmifera is believed to have originated from a mutation from the savoy cabbage, B. oleracea capitata, L. sabuda subgroup (Mills 2001). The term "Brussels sprout" is a countable noun whose plural form is Brussels sprouts. A commonly used alternative form is brussel sprout, whose plural is brussel sprouts. However, linking the name with the Belgian capital of Brussels would argue against dropping the last "s" in the first word (although the Dutch name for the city is "Brussel"). Some house styles (for example, the Chicago Manual of Style) prefer to lowercase words derived from geographical names when used with a non-literal meaning; in other words, brussels sprouts rather than Brussels sprouts. Brassica olearacea var. gemmifera is a cool season biennial, with axillary buds produced in the leaf axils during the first year of growth and a seed head produced in the second year of growth (Mills 2001). The stems are light grayish green in color, with the axillary buds produced beneath the leaves in the nodes of the elongated stem. The roots are shallow, with eighty percent of the roots growing in the upper eight to twelve inches of soil (Mills 2001). The simple, alternate leaves are round to heart-shaped with long petioles; they are light green to deep grayish-green in color (Mills 2001). The flowers are perfect (with male and female parts) and borne in terminal racemes (Mills 2001). Flowering is stimulated by temperatures below 45 degrees Fahrenheit for one or two months (Mills 2001). The flowers are insect pollinated. The sprouts are modified leaves forming a cabbage-like "head" (Mills 2001). Many rows of sprouts are produced on a single long stem (Herbst 2001). These leafy green buds resemble miniature cabbages, with forms popular for food ranging from 1/2 inch in diameter to 2 inches in diameter. Among the many cultivars created are such popular types as "Catskill" (or "Long Island Improved," a dwarf variety with medium sprout size), "Jade Cross" (compact variety with medium size sprouts), "Early Morn Dwarf Improved" (dwarf variety), "Breda" (taller, earlier cultivar type), and "Red Vein" (later maturing, more hardy cultivar). 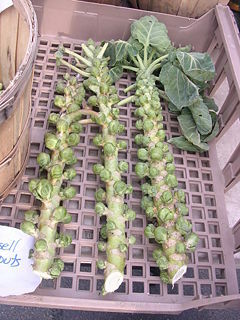 Two main cultivated types of brussels sprouts are a tall variety, which stands 2 to 4 feet tall, and a short variety, which grows to a maximum of 2 feet (Mills 2001). Brussels sprouts grow in temperature ranges of 7 to 24°C (45 to 75°F), with highest yields at 15 to 18°C (60 to 65°F) (Mills 2001). In commercial productions, plants grow from seeds in seed beds or greenhouses, and are transplanted to growing fields (Mills 2001). Fields are ready for harvest 90-180 days after planting (Pfyffer 2004). 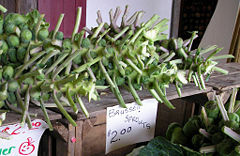 The edible sprouts grow like buds in a spiral array on the side of long thick stalks of approximately 2 to 4 feet in height, maturing over several weeks from the lower to the upper part of the stalk. Sprouts may be picked by hand into baskets, in which case several harvests are made of 5 to 15 sprouts at a time, by cutting the entire stalk at once for processing, or by mechanical harvester, depending on variety (Pfyffer 2004). Each stalk can produce 1.1 to 1.4 kilograms (2 1/2 to 3 pounds), although the commercial yield is approximately 0.9 kilograms (2 pounds) per stalk (Mills 2001). Mills (2001) reports that Europeans prefer smaller sprouts about 1/2 inch (1.3 centimeters) in diameter, while Americans prefer those 1 to 2 inches (2.5 to 5 centimeters) in diameter. Total United States production, in 1997, was approximately 32,000 metric tons, with a value of $27 million (Mills 2001). Ontario, Canada produces somewhat less than 1,000 metric tons per year (Mailvaganam 2008). In Continental Europe, the largest producers are the Netherlands, with 82,000 metric tons in 2003, and Germany, with 10,000 metric tons in 2003 (Illert 2004). England has production comparable to that of the Netherlands, but is not generally exported internationally (Illert 2004). Cultivation of Brussels sprouts in the United States began around 1800, when French settlers brought them to Louisiana (Mills 2001). Commercial production began in the United States in 1925 in the Louisiana delta, with the center of production moved to mid coastal California by 1939, with some production in New York State (Mills 2001). The first plantings in California's Central Coast began in the 1920s, with significant production beginning in the 1940s. Much of the United States' production is in California, with a smaller percentage of the crop grown in Skagit Valley, Washington, where cool springs, mild summers, and rich soil abounds and to a lesser degree on Long Island, New York (USDA 1999). Currently, there are several thousand acres planted in coastal areas of San Mateo, Santa Cruz, and Monterey counties of California, which offer an ideal combination of coastal fog and cool temperatures year-round. About 80 to 85 percent of U.S. production is for the frozen food market, with the remainder for fresh consumption (USDA 1999). Brussels sprouts are a rich source of vitamin A, vitamin C, folic acid, and dietary fiber (Bender and Bender 2005). They also are a fair source of iron and vitamin B6 (Herbst 2001; Bender and Bender 2005). Moreover, they are believed to protect against colon cancer, due to them containing sinigrin. Once harvested, sprouts last 3 to 5 weeks under ideal near-freezing conditions before wilting and discoloring, and about half as long at refrigerator temperature (Mills 2001). The usual method of preparing a brussels sprout for cooking is first to cut off the base together with any remaining stem, and then to peel away and discard the surface leaves that are loosened by this cut. When boiling or steaming, some cooks will cut a cross in the stem to aid the penetration of heat to the center of the sprout. In 2007, Ireland's Food Minister Trevor Sargent described his preferred method of cooking of brussels sprouts: Placing the sprouts in a single layer in a saucepan, covering them in just enough water to cover the stalks and boiling with salt and butter until the water is absorbed (IDAFF 2007). Microwaving, stir frying, roasting, and steaming are also options. Overcooking releases sulfur compounds in the vegetables that give it a distinctive smell commonly found unpleasant. If correctly cooked, the unpleasant smell is avoided and the vegetable possesses a delicate nutty flavor. In the UK, brussels sprouts are a traditional winter vegetable, and are often eaten boiled with a roast dinner, particularly at Christmas. They can also be stir-fried, roasted, or made into soup. Folsom, J. 2005. Plant trivia timeLine. The Huntington Library, Art Collections, and Botanical Gardens. Retrieved June 30, 2008. Illert, S. 2004. The small market study: Brussels sprouts. Gemüse (München) 40(12): 56-58. Retrieved June 30, 2008. Ireland Department of Agriculture, Fisheries and Food (IDAFF). 2007. Food Minister Trevor Sargent promotes seasonal eating while inspecting the Brussels sprout crop for Christmas. Department of Agriculture, Fisheries, and Food. Retrieved June 30, 2008. Mailvaganam, S. 2008. Area, production and farm value of specified commercial vegetable crops, Ontario, 1998-2002. Ontario Ministry of Food, Agriculture, and Rural Affairs. Retrieved June 30, 2008. Mills, H.A. 2001. Brussel sprouts, Brassica oleracea var gemmifera. University of Georgia College of Agricultural and Environmental Sciences. Retrieved June 30, 2008. Pfyffer Associates. 2004. Brussels sprouts info. Pfyffer Associates. Retrieved June 30, 2008. United States Department of Agriculture (USDA). 1999. Crop profile for Brussels sprouts in California. United States Department of Agriculture. Retrieved June 30, 2008. PROTAbase on Brassica oleracea (Brussels sprouts). This page was last modified on 6 July 2016, at 23:00.